I’ve been struggling to write a blog post that will accurately convey how I feel about the new word up there in my blog title… or, rather, the fact that it’s been added to my blog title. I honestly don’t know where to start on that topic, or where to end for that matter. While I was trying to gather and organize my thoughts, and failing miserably, I started looking for other similar blog posts. How do other new-ish Christians do this?? I stumbled upon a post that I pretty much adore. I can relate to the author so, so, so very much right now. So while I’m still struggling with what I want to say about my own walk, and how I can possibly say it (without writing a novel), I’m just going to share this… I hope someone enjoys it as much as I do. Once upon a time, there was a girl with a blog. She loved her blog. She posted on her blog, a lot. She loved to share photos of her children growing up, so that far-away grampys and other friends and family could check in and see her little darlings (because who wouldn’t want to see them??). She also loved to tell stories on her blog, mostly about said little darlings. Some days, writing blog posts was this girl’s form of therapy. Sometimes you just have to put something in writing, get it out there… she did that a lot on her blog. Then, Facebook happened. The girl’s father noticed soon after the girl discovered Facebook that she wasn’t posting as many blog posts. In all his wisdom, the girl’s father told her one day, “You know, Facebook is not a replacement for your blog.” The girl yeah, yeah, yeahed her wise father (like girls tend to do)… and, sure enough, Facebook replaced her blog. Today, the girl is pretty much a Facebook junkie. She’s one of “those” people who posts way too much, and too often, on Facebook. Facebook is her blog X1,000. More pictures, more peeks into her mundane life, more random thoughts that enter her head and make their way WAY too easily to the rest of the world, in just a few clicks. Through Facebook, the world knows what the girl eats, what she wears, how she’s feeling at any given moment, and how many days ’til the next thing she’s looking forward to. The girl figures, with all of THAT information about her and her little darlings available instantly on Facebook, what’s the point of writing blog posts anymore?? So years pass… the blog is neglected and Facebook replaces it. And a lot changes in the girl’s life (of course, it’s all posted on Facebook). But one day, the girl realizes how much she misses posting on her blog. How sometimes there are things she wants to say, and she wonders, “is this appropriate to post on Facebook? What will people think about me if I post this? Who will unfriend me if I say that?” Truth be told, being a Facebook user is stressful. And the girl misses the forum of her blog, where she feels more freedom to say whatever she wants to say, however she wants to say it (after all, only approx. 3 people ever read her blog posts anyway). So, the girl decides to try her hand at blogging again. Then she wonders if she should start a whole new blog, because so much has changed in her life since she last posted. But the girl is uncomfortable with the idea of a clean slate. In the years that her blog was so neglected, she still visited it often, looking up memories of her life, her kids’ lives, etc. She loves that all of that is available on her blog; she doesn’t want to just “get rid” of any of that. It’s been part of her journey, after all. Last night, Nick and I gave Damon his “big” Christmas gift… a few days early, yes. 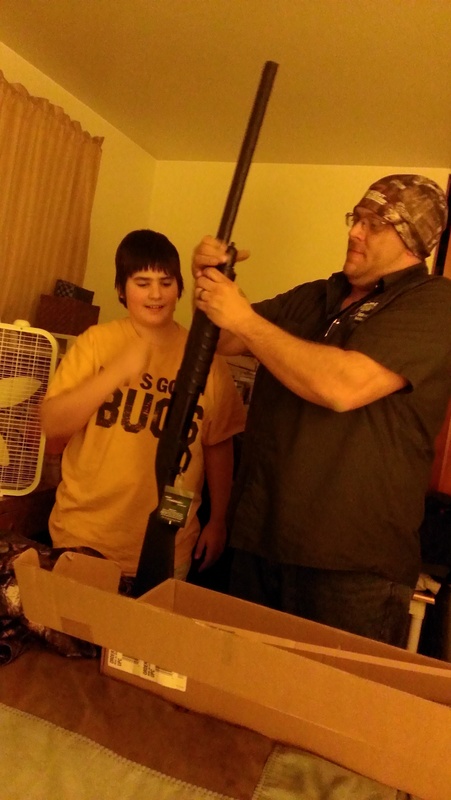 Because he already pretty much knew that his big gift was a new 12-gauge shotgun that he’d been asking for. And he asked Nick if they could go duck hunting this morning… and Nick was like “wellll, it would be nice if he had his new gun to take hunting…” So we decided that it probably wouldn’t totally ruin Damon’s Christmas if he got his “big” gift early. And then it hits me, right in the center of my heart (not necessarily in a bad way), that I had nothing to do with THAT. That half of the person Damon is, it didn’t come from me. I certainly didn’t teach him about guns and gun safety and hunting and where to shoot various animals and what to do with them afterward. 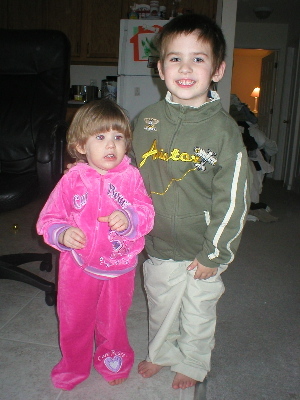 I also didn’t teach him how to shoot a bow… or how to drive and work on a four-wheeler… or how to hit a baseball. So much of the person that Damon is came from his dad, clearly. And the same can be said for Avery. I really can’t even begin to imagine what these children would be like, who they would be, without Nick’s influence, without him being here, present in their lives, every single day. I’m incredibly grateful that my children have a hands-on dad who loves them and guides them and has such a huge impact on the people they are becoming. Looking at Nick and Damon, fiddling with his gun, last night, I was so overcome with pride… not just for Damon but for his dad, my husband. I doubt if he gives himself enough credit for the role he plays in our kids’ lives and realizes just how much he means to them, and how much that means to ME. So this is my shout-out… to Nick and to all the dads out there who are present in their kids’ lives and making a difference, every day. 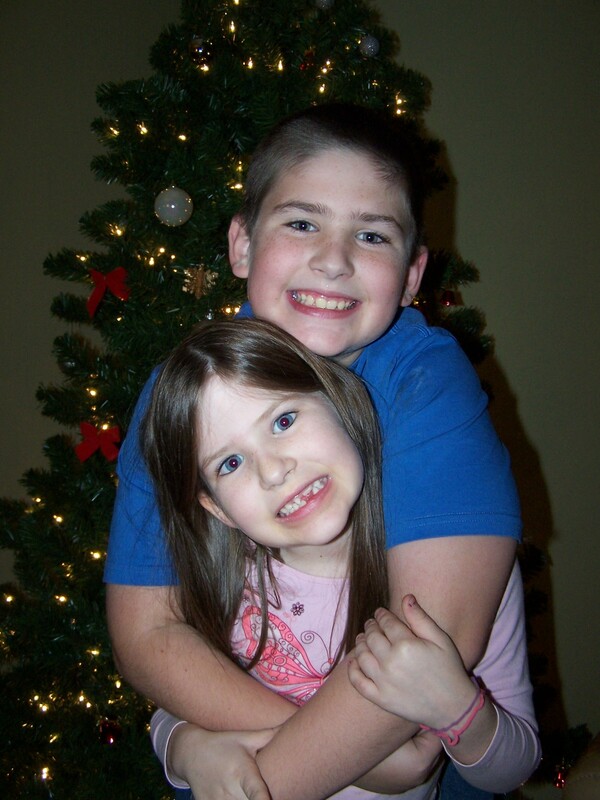 Nick and I both had to work today… so our lovelies were home on their own until I got home this evening. So, I made sure I had the ringer on my phone turned up while I was at work, just in case they needed me. Uhhh, apparently they needed me… a lot. I’m pretty sure my co-workers were just as annoyed as I was after hearing my phone BLOWING UP all day. First it was Avery calling, whining, because Damon wouldn’t get off of her computer and out of her room (where the computer is). So I tell Avery, “let me talk to your brother.” She yells for him and I hear him scream back, “NO!” No?? But, wait, I’m an hour away at work, so what the heck am I supposed to do about this refusal exactly? So I pull out the low Mom-means-business voice and say, “you tell your brother to come to the phone NOW… or he’s gonna be in BIG TROUBLE.” (Co-workers are definitely snickering now, and I can’t blame them one bit… I’m even cringing on the inside as I hear these words come out of my mouth.) So Damon finally comes to the phone and gives me attitude and pretty much hangs up on me. Again, GASP. And, again, what the heck am I supposed to do about it?? 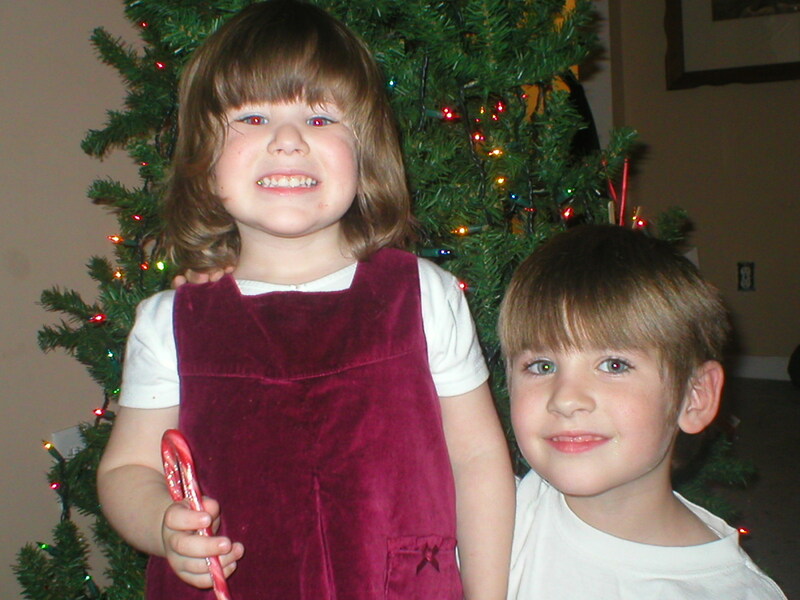 Avery: Mom… do you still use your hair straightener? Avery: Wellll… you might wanna think about getting another one. Me: What did you do, Avery?? Me: Oh my God… (and aside to my co-worker Natalie) Wait until you hear this one! Avery: Soooo… I tried to use the straightener on her hair, and it kind of… STUCK to it. Me: So, basically, you melted Barbie hair on my straightener?? Me: Okay, Avery. Do me a favor and don’t use any more electrical devices until I get home, okay?? I mean, seriously… WHAT is a mom supposed to do at this point? 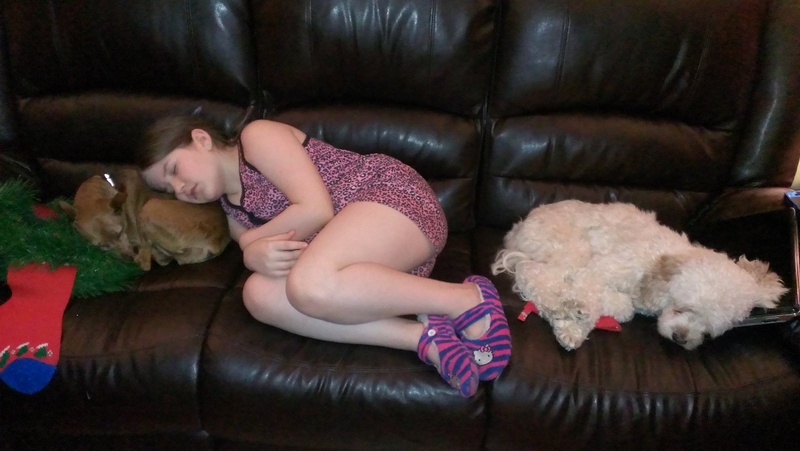 So, I called their dad and asked him to call and check on them, to make sure they were still alive and had their hair… because I was genuinely concerned but couldn’t deal with calling myself and talking to either one of them… AGAIN. And this is just Day One of a 3-week vacation??? Lord help me. 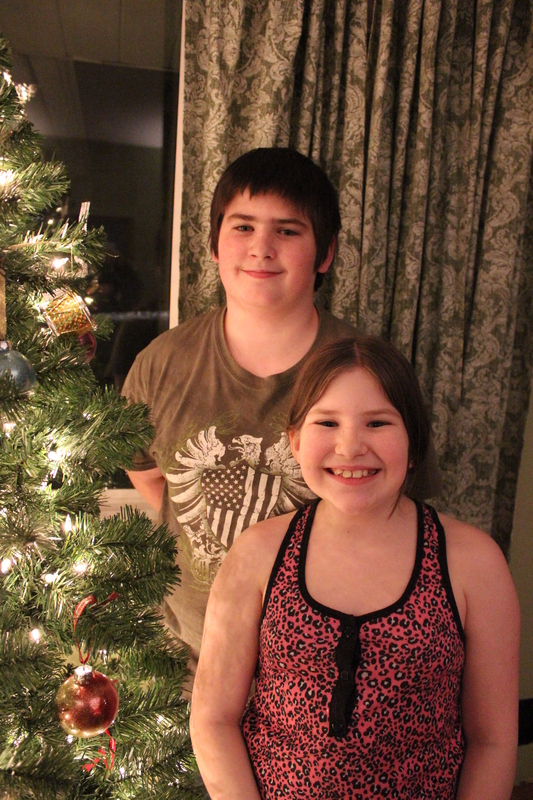 I took a picture of the kids standing by the Christmas tree as they were decorating yesterday… and, even though I see them EVERY day, even I was amazed by how huge they looked. 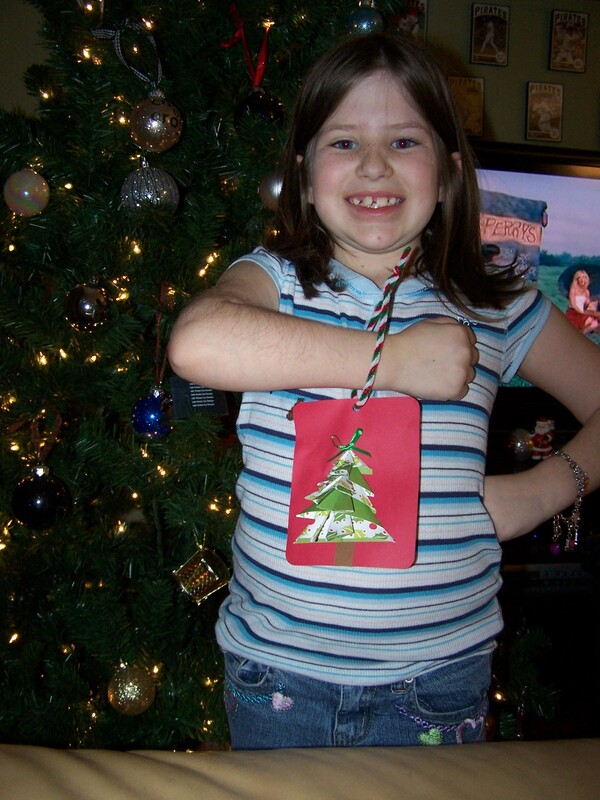 So I thought it would be fun to hunt for some older “decorating-the-tree” pics from years past and see how they compare. 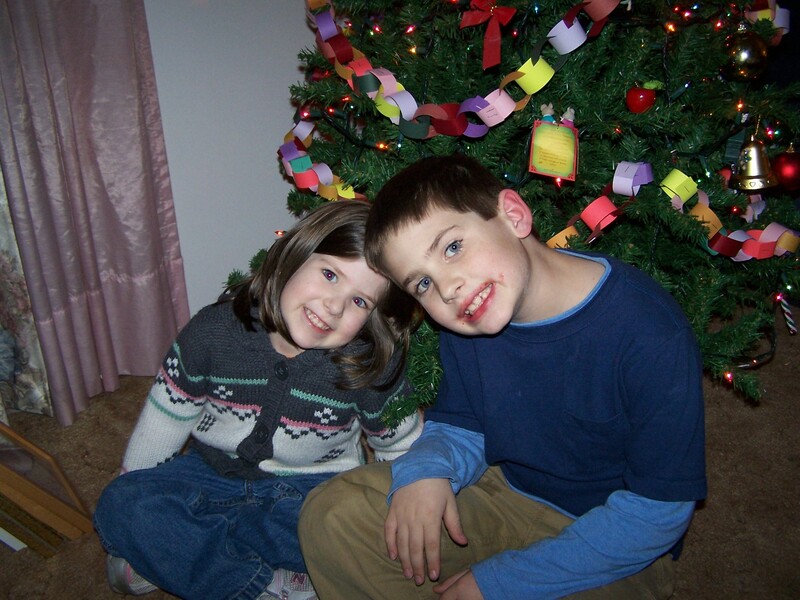 Though this first one is not a decorating pic, it was the kids modeling the Christmas outfits that my Granny sent them… so it was around the same time as tree decorating! Ummm… How does that happen exactly?? My husband is a funny kind of person. Most people who know him, or think they do, would never imagine that hiding under that cool, redneck, “I-don’t-give-a-f***” exterior is a meticulous, OCD, control freak. But if you’ve seen him decorate a Christmas tree… or *gulp* tried to HELP him decorate a tree?? Oh, you know. I guess it was Christmas of 2001, when Damon was just under a year old, and Nick and I moved into our very own trailer paradise in Laurel, Delaware, that we found ourselves broke as a joke, with no Christmas “stuff.” So, we found a tree on sale for $19.99 at Rite Aid and stocked up on $1 ornaments/trimmings from the Dollar Store… and I got my first glimpse of his OCD when it came to putting up that tree. (Luckily for him/us, I’m perfectly happy to sit back let him work his magic when the OCD surfaces! It might be one of the only reasons we’re still married today.) 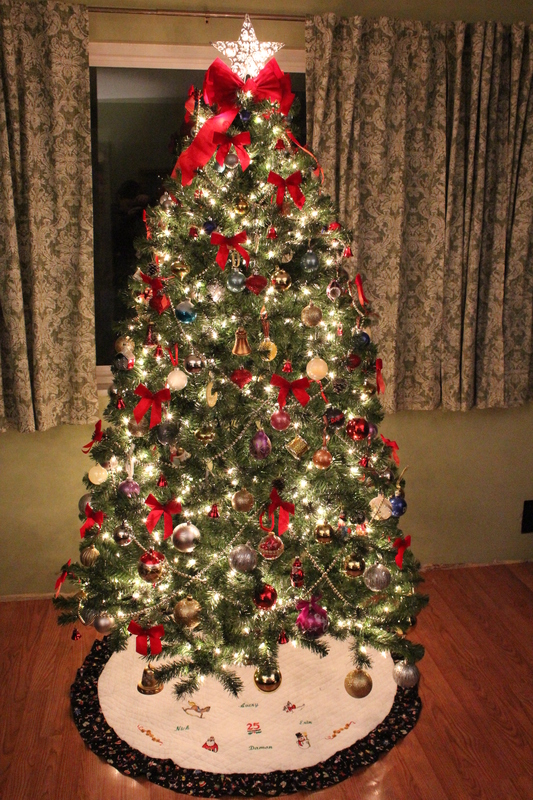 But, the end result was pretty amazing… especially for a $20 tree and cheap, plastic $1 ornaments!! 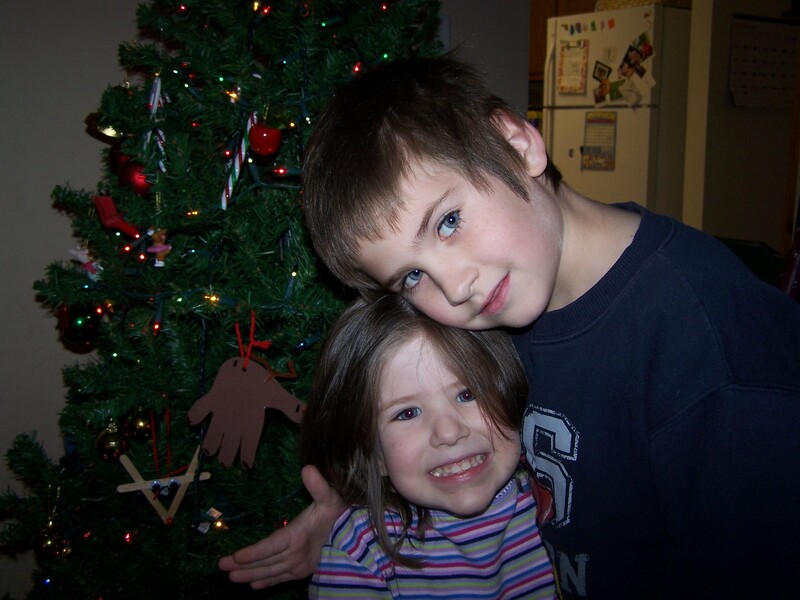 Fast forward several years, to when we now have two young children and a couple of destructive dogs… and suddenly, the beautiful Christmas tree was really not that important to me. For the last many Christmases, I’ve set the tree up (which became much easier a few years ago when we finally bought a bigger, pre-lit tree!) and then let the kids have their way with it. 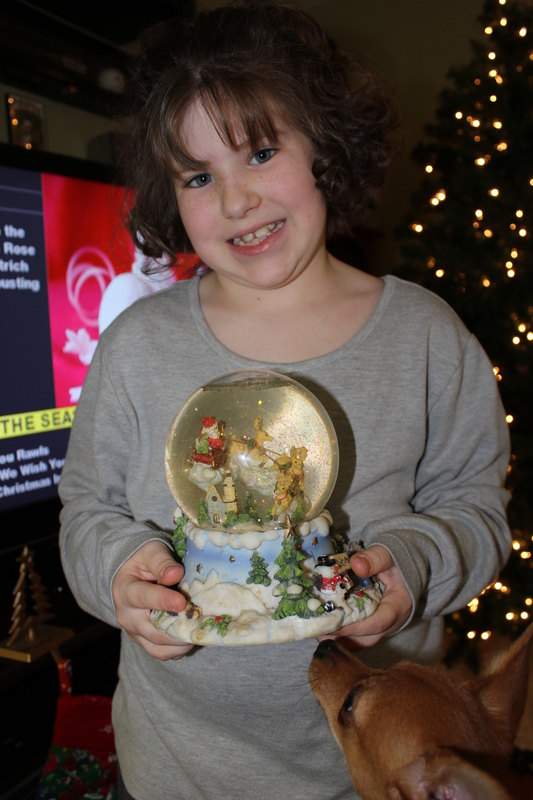 They throw the ornaments on there, randomly, usually lumped together in one or two places… and we call it done. It’s “their” Christmas, after all, right? So my plan this year was pretty much the same… set it up, let the kids decorate it while I sit back and watch The Grinch. But yesterday evening, while this was happening, I was sitting on the couch looking at what our tree was becoming… and I was getting more and more depressed. (Blame it on hormones… they’re powerful, annoying things for a mom skating dangerously close to a mid-life crisis!) Nick came upstairs from the garage, where he’d been working on his truck all evening, covered in grease and grime and muck… and I was pouting and said, “I want a pretty tree.” *pout* Nick said, “Okay… let’s go to the store. We need beads and bows and…” So off we went in search of more tree trimmings. Then we came home and the Tree Magician went to work. I wish I had taken video… he was screaming and hollering at the kids for not placing the ornaments EXACTLY where they should go (you know, there’s a science to this… smallest ornaments at the top, progressively getting larger as you move DOWN the tree… I had no idea that this was a thing, prior to Christmas 2001). Make sure you put that candy cane in the PERFECT spot, Witschey! Damon even helped out some… before exhaustion won out and he took to his bed, at around 1am. 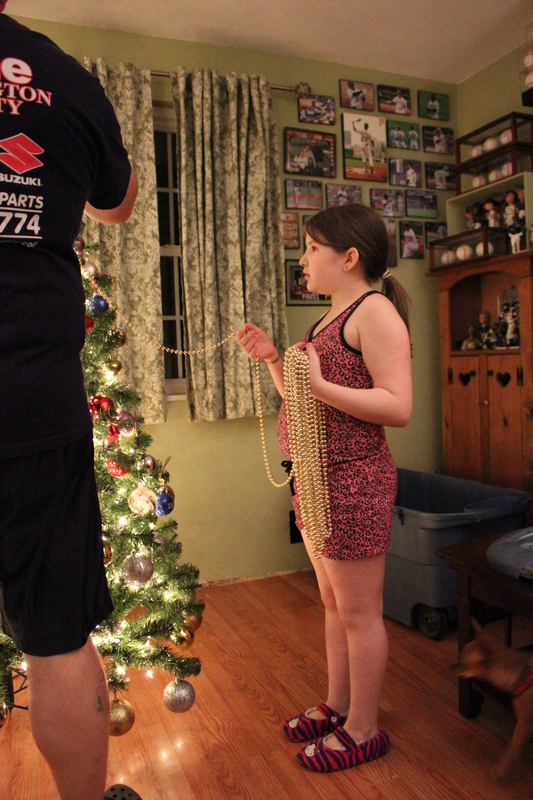 And once the ornaments are hung, then it’s time for the beads. Oh, those darn beads. 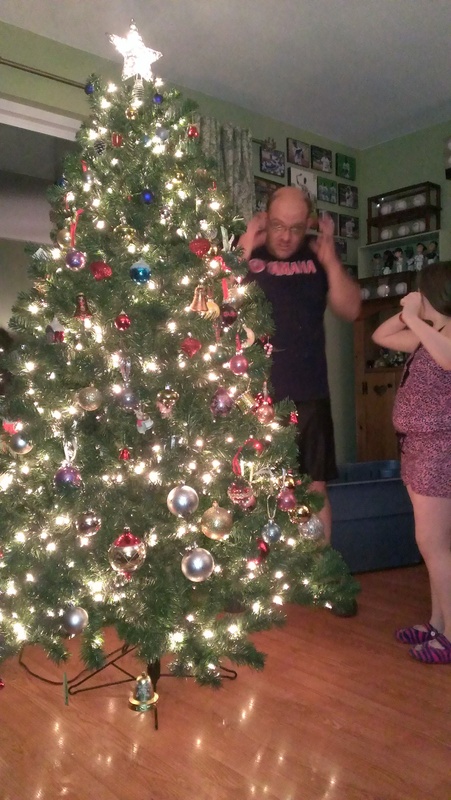 Avery was Daddy’s helper, following behind him as he walked circles around the tree, placing the beads. 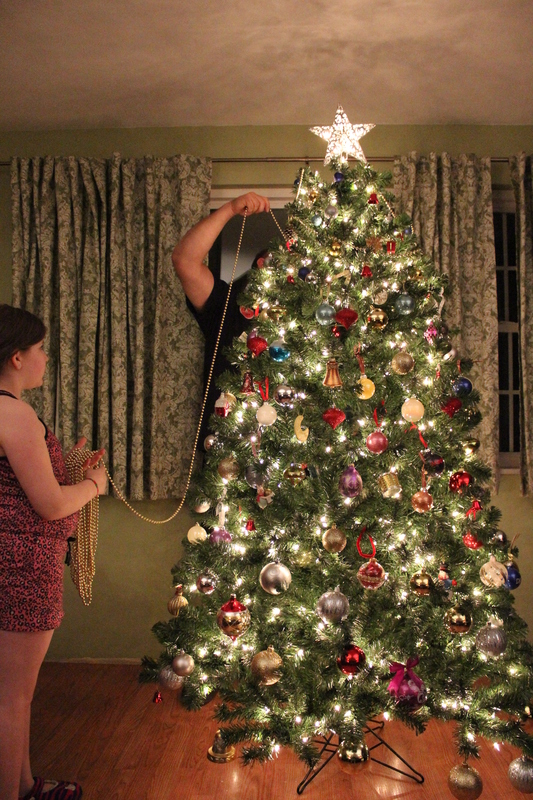 After the beads, we have bows and bells and pinecones… to fill in the “holes.” Oh, and the tree skirt! 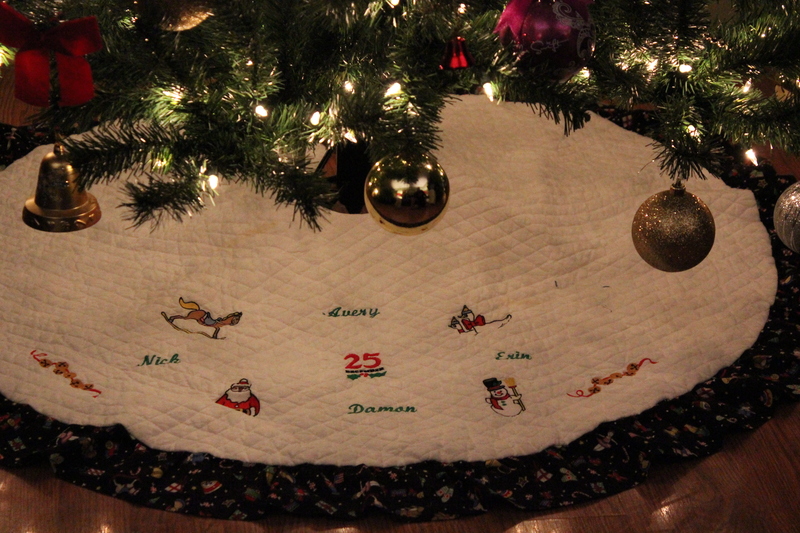 Can’t forget the tree skirt. I had to dig through the mountain of dirty laundry downstairs to FIND said tree skirt… because last year, when we were taking the tree down and packing it up for the year, I left it out to wash it. And, ummm, just got around to doing that last night. But finally, the CLEAN tree skirt made its way under the tree. My mom made this skirt for us in 2001, when there were only three names, and then added Avery to it a few years later. It’s a little small for our tree now (because our first tree was much skinnier at the base), but I still love it! 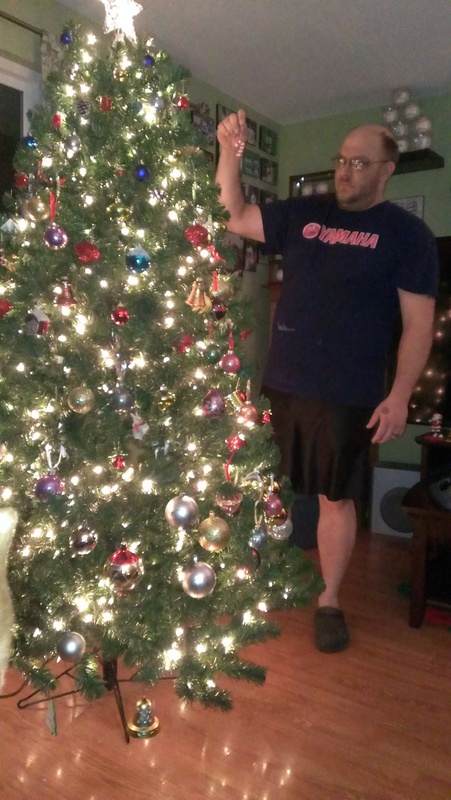 Finally, at 2:30am, the Tree Master deemed it done. 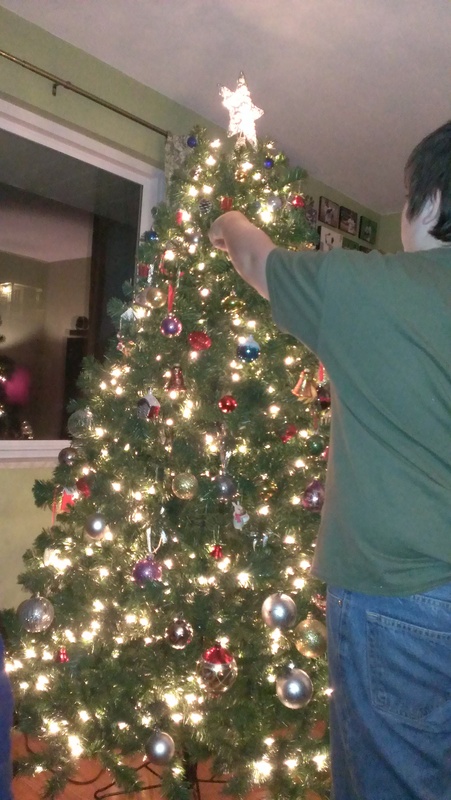 Well, almost done… we forgot to buy the candy canes (can’t have a tree without candy canes!!). So we’ll be adding those one of these days, I’m sure. But it’s mostly done. And it’s gorgeous… just like I knew it would be. On selfishness, forgiveness, healing, gratitude and looking ahead! As this year comes to a close, I can’t help but reflect on the last 12 months. To be perfectly honest, 2013 was an extremely tough year for me, personally, for reasons that I won’t state publicly. A part of me feels like I owe an apology to family members and friends for maybe not being as “available” as I should have been, as they expected or wanted me to be. But, quite honestly, the bigger part of me realizes that everything I’ve done, or haven’t done, in the last year was important for my own sanity and wellbeing. Yes, I’ve been quite selfish and have put my needs before others… I feel like I’ve done that a lot lately, a lot more than I’m maybe comfortable with. I’m sure I’ve upset people, as a result. I am truly sorry for upsetting anyone, whether it be my children, parents, grandparents, in-laws, or even neighbors and friends. 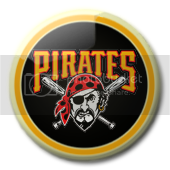 I never intentionally set out to hurt or piss off or treat anyone unfairly. If I’ve been selfish at times, it was because I needed to be, not because I’m a hateful, horrible, uncaring person who doesn’t think of or consider others. So while I hate the idea of hurting anyone unintentionally, I can’t apologize for trying to take care of myself in the bargain. People talk a lot about forgiveness. I talk and think A LOT about forgiveness these days. I think it’s one of those things that is easy to talk about in the abstract, and not quite so easy to practice in your everyday life. I’m trying, very hard, to practice forgiving those who have wronged me, in various ways. I hope those who feel wronged by me, in any way, will extend the same mercy. And I truly hope that, by this time next year, I feel more like myself and that some of these broken pieces will be put back together. To those who have stood by me this last year and supported me when I needed you, in any small way… I can’t express how grateful I am, for all of you, for what you’ve meant to me and how you’ve helped pick me up on especially bad days. I’m really not at all sad that 2013 is almost over; I’m ready to put it behind me and am looking forward to a bigger and brighter 2014!